SaintyCo today announced its new generation of blister packing machine series. RUI'AN, CHINA, March 24, 2018 /24-7PressRelease/ -- SaintyCo today announced its new generation of blister packing machine series. The new SaintyCo blister packing machines include a series 7 different types of machines, with or without cartoning line. With the new series of SaintyCo Blister Packaging Machines, product manufacturers can pack tablets, capsules, syringes, ampoules and vials. The new blister packing equipment allow for both small to large scale blister packaging processes. "Protecting and maintaining product integrity is a major concern in pharmaceutical, food processing or chemical industries," said Tony Zeng, SaintyCo export manager. "It is for this reason that SaintyCo is committed to providing turnkey solution in blister packaging for maximum productivity." SaintyCo BP Series Blister Packing Machines: These blister packing machines include SaintyCo BP 120 Small Packing Machine, SaintyCo BP 150 Alu Alu Blister Packing Machine, SaintyCo BP 180 Automatic Blister Packing Machine and SaintyCo BP 260 Tablet and Capsule Blister Packing Machine. Every blister machine has a different production capacity for Alu/PVC and Alu/Alu packaging process. Besides, SaintyCo has also incorporated their latest automatic technology, to reduce downtime and improve efficiency. The modular design also makes it easy for part changeover. 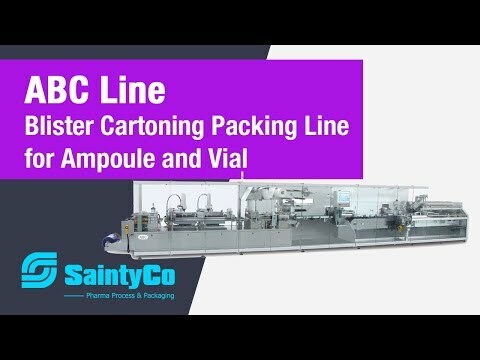 SaintyCo ABC Blister Cartoning Line: SaintyCo ABC Blister Carton Line is a fully integrated machine for liquid fills and Lyophilized glass vials with ampoules. These new series of blister pack sealing machines come as ABC-300 or ABC-400 series. SaintyCo CBC Capsule and Tablet Blister Cartoning Line: The new model of SaintyCo blister packing equipment allows for easy integration with other accessories such as carton packer, strapping machine, weighing machine, etc. This series of machine is an integration of SaintyCo BP-260 Tablet and Capsule Blister Packing Machine and SaintyCo CM-100 Cartoning Equipment. SaintyCo SBC Syringe Blister Cartoning Line: This machine has been optimized for vials and syringe blister packing. It features a new automated system with robot feeding systems. SaintyCo researches, designs and manufactures foodstuff and cosmetic machines. For over 15 years, SaintyCo has expanded to over eight factories that deal in capsule filling, blister packing and film coating machines, amongst others. All machines and equipment are CE and cGMP compliant. The latest in its product line is a series of tablets, capsules, syringes, ampoules, and vials blister packaging machines.